While Nic was writing his post on indigo, we got to talking about various groups of people who live in and/or traverse the Sahara. I have also been reading an article about a photographer who uses a motorized glider to take aerial pictures of the Sahara. Now my mind is lost in the past to another time in my life that almost seems like a dream. About fifteen years ago I lived and worked in the Western Sahara, a territory claimed by Morocco, whose native inhabitants, the Sahrawi, have been fighting for independence since Spain pulled out of the territory in the mid-70s promising a referendum. Morocco and Mauritania annexed the territory, with the northern 2/3s being controlled by Morocco, the remaining 1/3 controlled by Mauritania. The group leading the fight for independence—and a referendum—is called the Polisario Front, supported by Algeria. Their pressure caused Mauritania to give up control over its portion of the Western Sahara thereby allowed Morocco to extend its control over the entire territory. There was a ceasefire in 1991 at which time some Sahrawis chose to stay in the territory of the Western Sahara, administered by Morocco, and those who supported independence were forced into exile in refugee camps in the Algerian Sahara. In the interim, efforts have been made to hold a referendum to decide the future of the territory. More information is available here, on Wikipedia. Morocco is keenly in favor of making the territory part of Morocco—in fact, Morocco refers to the Western Sahara as the “Southern Provinces—and has has full administrative control over the territory. 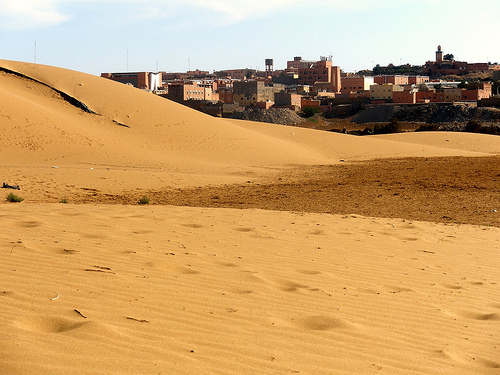 The capital of the Western Sahara is Laayoune (also spelled El Aiun) which means “two eyes” or “two wells” (they use the word “eye” to mean “well” as both sight and water are considered vital to human life). This tiny dot on the edge of the Sahara was my home for a year. Those Sahrawis who went to live in the camps in Algeria have not be able to visit family back in the Western Sahara. In their harsh conditions in the camps, Sahrawis were cut off not only from their families, but also from the rest of the world. Water and food have to be shipped in to the camps, and all the medical, educational and social needs are take care of by the refugees themselves or with help from the UN and aid agencies around the world. My reason for being in the Western Sahara was to be part of the team that registered voters for the ever-elusive referendum. I worked for the UN in New York City and had the opportunity to go overseas to work for the UN Mission for the Referendum in the Western Sahara (aka MINURSO). My base was in Laayoune, the capital, but I also spent a lot of time in the MINURSO offices in Algeria. My work consisted of maintaining a database of voter registration files and providing information for the election officers who were responsible for interviewing voters. The process was incredibly complicated by factors unique to the area. Prospective voters were spread across all of the territory of the Western Sahara, as well as in the refugee camps and throughout Morocco. Some of them had emigrated and had to be tracked down and contacted overseas. Many of the voters were illiterate and a lot of the older voters didn’t know what year they were born. Older generations in this area often remember important dates by events that occurred then like “I was born the year that the wind blew from the east for 2 weeks”. I feel that I could write so much more on this topic, specifically about my life there and about our work with voters. These topics might require several posts, so I will constrain myself here to talk about henna in the Western Sahara. What prompted this post about the Western Sahara was this Flickr set I came across about the UNHCR’s (the United Nations High Commissioner for Refugees) story about Sahrawi families reuniting. As a henna artist and also a researcher, my eyesight has been trained to seek out and find henna in any photo and sure enough, my eyes were rewarded. A lot of the women in these photos have henna which is not surprising since henna is often done before a trip to protect the traveler from evil and also to celebrate a happy occasion, in this case a reunion of families. My very first experience of henna was when I was living in the Western Sahara. We were flown to our headquarters in Tindouf, Algeria, smack dab in the middle of nowhere in the Sahara. This was the town closest to the refugee camps where we had to register voters. The Algerian army had given the UN one of its bases to serve as the headquarters for MINURSO, and that is where we lived, ate and worked whenever we weren’t in the refugee camps. One of my colleagues returned from the refugee camps with a brown stain on her hand; the stain was a boldly drawn Polisario flag. My colleague explained the concept of henna to me but my brain couldn’t quite grasp the idea. As she explained I remembered all the times I had seen orange fingernails and dark brown fingertips while living in the Western Sahara and things started to click. Since that day I have continued to look for henna whenever I travel in Morocco, stopping women to ask them about it. Enjoy the photos at the UNHCR link!